In a nutshell, the Ethiopian Ministry of Health requested PC’s assistance to develop the capacity of hospitals, health posts, health centers, organizations and communities to plan, coordinate and deliver HIV/AIDS services. My official job title is a Community HIV/AIDS Advisor , and to prepare for our future work, we have intensive training for the first 10 weeks in country. The components include the following trainings: language, cultural/host family, safety and security, personal health, and technical/skills. 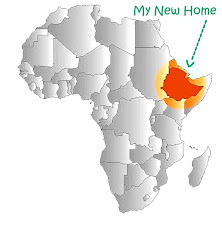 About halfway during training, we will be assigned to our permanent site, and also to an Ethiopian counterpart, who will be of great help to us once we are settled in. The first three months at site we will be responsible for doing a community needs assessment (CNA). Basically, we are here to involve the community in which we live in everything we do – we are here to assist and share ideas, not lead. PC does work under 3 pillars in the HIV/AIDS realm: Prevention, Care & Support, and with Orphans and Vulnerable Children (OVCs). We’ll be working from the bottom up, as we are not yet sure of what our community actually needs. Our perceived needs could be very different from their actual needs, and that’s why we’ll spend 3 whole months assessing our site. Nothing is set in stone as to what each volunteer will be doing, but after our CNA, we will have 2 years to complete a primary project within our community with an identified host organization (secondary projects are allowed). Nice, Have you played hop scotch yet? You make a mommy proud! Laura, I am so excited to hear about your adventures! GHIVE misses you very much.